Midfielder Cameron McGeehan is hoping to continue being a long ranger for the Hatters this season. The 21-year-old was on target for his eighth of the campaign against Mansfield last weekend, drilling past visiting keeper Scott Shearer from 25 yards. “I scored one against Wycombe last year, but I haven’t really scored so many, so I’d like to add that to my game and obviously that helps. In McGeehan’s tally this term, only one other has come from outside the area, that a heavily deflected strike against Stevenage, as he said: “Teams sit in against us a lot and it’s hard to maybe get the shots off from longer distances because there are a lot of bodies in there. “Before the game I was thinking to myself, I’m playing a bit deeper, maybe I’ll get the ball more, pass it around more but, if I can, I’ll have a dig from longer. “I had a couple of efforts before, getting my eye in and then the chance came. Jack (Marriott) set me off nicely and I practice my long shooting a lot. “You get a certain amount of goals from penalties, a few goals from runs into the box and then if you add a few long range ones, you’re talking about a lot of goals, so I’m trying to work on all aspects. 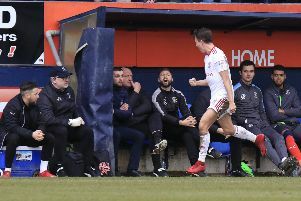 On his effort against the Stags, McGeehan continued: “It was a good angle, you could see the space, I executed it right and it was going in but I’m not going to use that cliché that you know as soon as you hit it, because I didn’t. “But you see the keeper going for it, luckily he didn’t get a hand to it and away we go. The goal puts McGeehan level with Danny Hylton as Town’s leading scorer this term, although boss Nathan Jones knows the youngster owes a lot to his team-mates, adding: “We can say about Cameron week in week out, he has a role that allows him to do that, so a lot of his credit goes to a lot of his team-mates as well for their supply. “But he has a desire to score goals and we want that desire. If he didn’t have that then we have others who can do that kind of thing, but he has a fantastic goal record.